Direct is the default value for FS_METHOD. However, you or your developer may changed this in the past. My first recommendation is to look for FS_METHOD in wp-config.php. wp-config.php is located in the main directory of your WordPress website. If you find the FS_METHOD set the value of that to direct and try to install a theme or plugin. If you followed the previous steps and either you didn’t find FS_METHOD in your wp-config or your FS_METHOD is set to direct and still you are not able to install a plugin/theme then you might have file permission issue. Installation failed: Could not create directory. In this scenario, you need to adjust the file system permissions on your server. For doing this step you need to have SSH access to the server. First, connect to your server using SSH command. Chown command will change the owner of the root directory and will fix the permission issue. 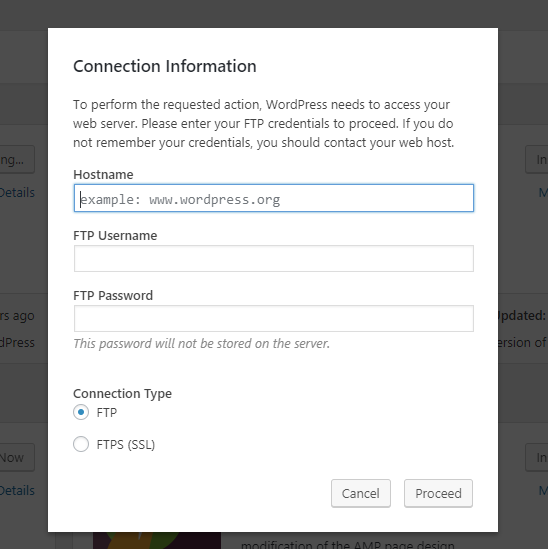 Now PHP(WordPress) should be able to create a directory. Now can try to install your plugin/theme.